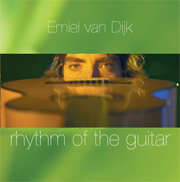 “Met Rhythm of the Guitar bewijst Van Dijk een even formidabel componist als Gitarist te zijn." "This instrumental album grabbed me from the word go; Van Dijk plays with passion, creativity, virtuosity and flair." "The music is played with a lot of passion and energy and the listener is taken on adventurous musical journeys. Influenced by Brazilian, blues, pop, flamenco and classical music."